Fourth time is a charm? No? Well, in my case was nearer to SIXTH time - and NOT so lucky - until I gave up trying my luck making pâte à choux for this week's French Friday with Dorie recipe. Up until a week ago I had no idea it existed, let alone what it was. But I learned, oh yeah, I learned all about it.... the hard way. Paris is the capital of France and Brest is a small town, 500 km west of Paris at the Westernmost part of Bretagne, again in France. So you have two cities, miles apart, with nothing in common, other than the fact that they are both in the same country, and have a strange circular dessert named after them. Why in the world would someone name a pastry after not one, something that many pastries around the world have in common, but two cities that are so far from each other? Only in France!!! Distance is the key here as well as the fact that the French love bicycle races almost as much as sweet pastries. There are almost a dozen races every year. They cover virtually every part of the country, culminating to the world famous Tour de France in July. All of them are quite popular with both professional and amateur bicycle racers, but only one of them has its own dessert named after it. 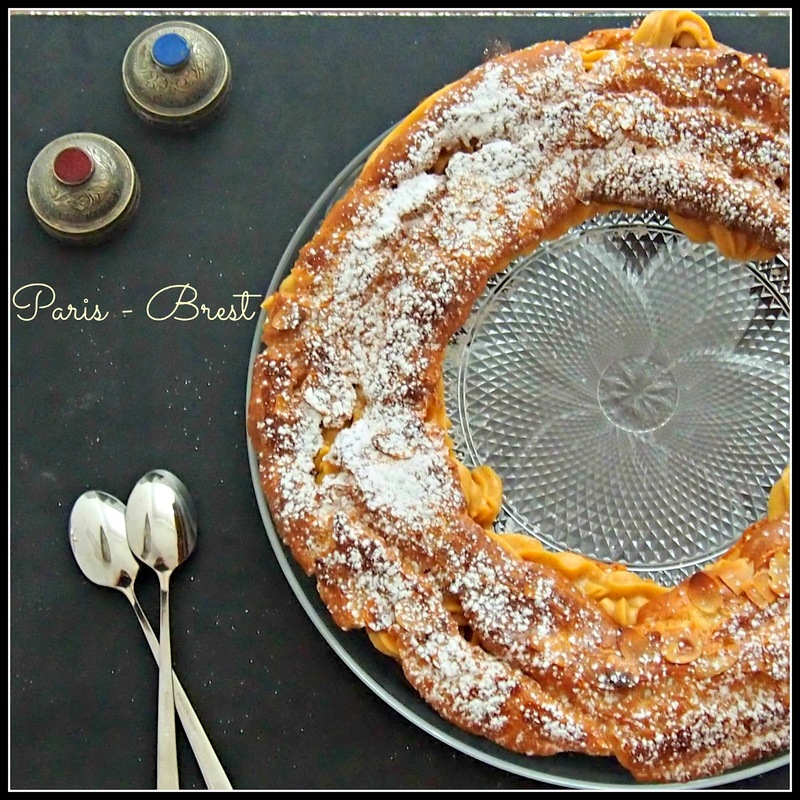 The Paris - Brest. A 1200 km high endurance race from Paris to the town of Brest and then back to Paris, is one of the oldest bicycling events in France. And the circular choux pastry filled with praline flavoured cream that you see above and which I had to make over and over until I got it, almost right, was created to celebrate this race. It became very popular among the bicyclists and the spectators and not because its shape reminded them of a bicycle wheel. It was the praline pastry cream! Its flavour is just heavenly. The pastry chef who came up with this recipe was truly an artist. Because on their own the praline paste and the vanilla pastry cream are okay. Not bad but neither great. When you put them together though, they become something amazing! A flavour elevated to a whole new level of deliciousness. But let me start from the beginning. That is the pâte à choux. Traditionally French and notoriously troublesome to those of us who are not seasoned bakers, but absolutely necessary to showcase the majesty of the cream. It is airy and light and melts pleasantly in the mouth. Then there is the praline. A potent paste made from roasted almonds and hazelnuts coated in hot caramel and then whizzed around in the food processor until it all becomes THE most luscious nut butter. You can just eat it on its own or spoon it on a piece of bread. In fact I've done both, while waiting, utterly frustrated for the choux to bake, and I had to restrain myself from eating it all because a good part of it has to go into the actual pastry cream. That is a very traditional vanilla pastry cream made with cornflour, milk, butter and plenty of egg yolks. It is good, thick and packed with calories, much appreciated I guess from all the cyclists participating in the race. But as I said before the magic happens when you mix those two together. The overwhelming smokiness of the praline mellows and the underwhelming thickness of the cream becomes more elegant. To me it is the definition of balance. One bite of the finished whole and I forgot how difficult it was to tame the choux rings and make them sit as they were supposed to sit so that they puff and huff and stay high. Six times I had to make the pastry. More than four hours I spent in front of the oven willing it to rise. And 24 broken eggs later I managed to get it to stay halfway were I wanted it. After that I gave up and decided it was time to eat it! To check out how my fellow Doristas liked this recipe click here. 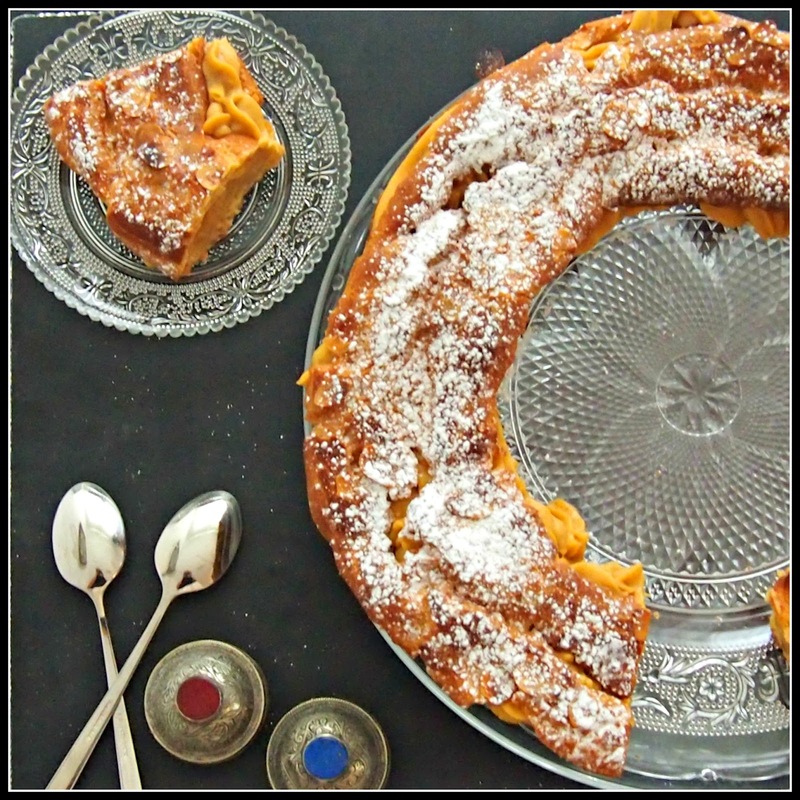 I suggest you tackle this dessert in stages like a bicycle race, as Dorie says in her book. First make the praline paste: Spread the almonds and the hazelnuts on a silicon mat or a piece of baking paper. They have to be close together but not on top of each other. Set it aside for now and concentrate in making the caramel. Put a heavy bottomed saucepan over a medium heat and combine the sugar and the water. Swirl the pan around to combine them but DON'T stir them. If you stir them the caramel will crystallize and this is not very good. When the syrup reaches a dark amber colour, anything between 10 - 15 minutes remove it from the heat and carefully pour the caramel over the nuts. Now for the pastry cream: Whisk the egg yolks together with the sugar and the cornflour in a medium, heavy bottomed saucepan until they are all blended very well. Bring the milk to a boil in another smaller saucepan. Brace yourself for the pâte à choux: Preheat your oven to 425F/220C. Draw an 8-inch (20cm) circle on a piece of baking paper, turn it over and use it to line a baking sheet. This going to be your piping guide. You can use the bottom of a baking pan or a lid to draw the circle around it. Fit a large pastry bag with a large plain tip (1 inch/2.5cm). If you don't have a tip just cut the end of the bag. In a medium heavy bottomed saucepan, bring the milk, water, butter, sugar and salt to a rapid boil, over high heat. Add the flour all at once, lower the heat to medium-low and start stirring with a wooden spoon. The dough will come together quickly and a crust will form on the bottom of the pan. Keep stirring vigorously for another minute or two to dry the dough. It should be very smooth. Turn the dough into the bowl of your stand mixer fitted with the paddle attachment. Let it sit for a minute and then add the eggs one at a time. Make sure that each one is fully incorporated before you add the next. Beat, until the dough is thick and shiny. Once it the choux pastry is made, it should be used immediately, so now spoon it into your prepared pastry bag and pipe a thick stream along the circular guide line on your baking paper. The trick, according to Joe Pastry is to keep the tip well off the paper and let the pastry fall out of the bag from a height of at least 1-inch (2.5cm). Otherwise the pastry will spread out, which is what happened to mine and is not good. Once you have your first ring, pipe a second ring of dough inside the first ring, barely touching each other. Now pipe a third ring on top of the other two, right in the middle. 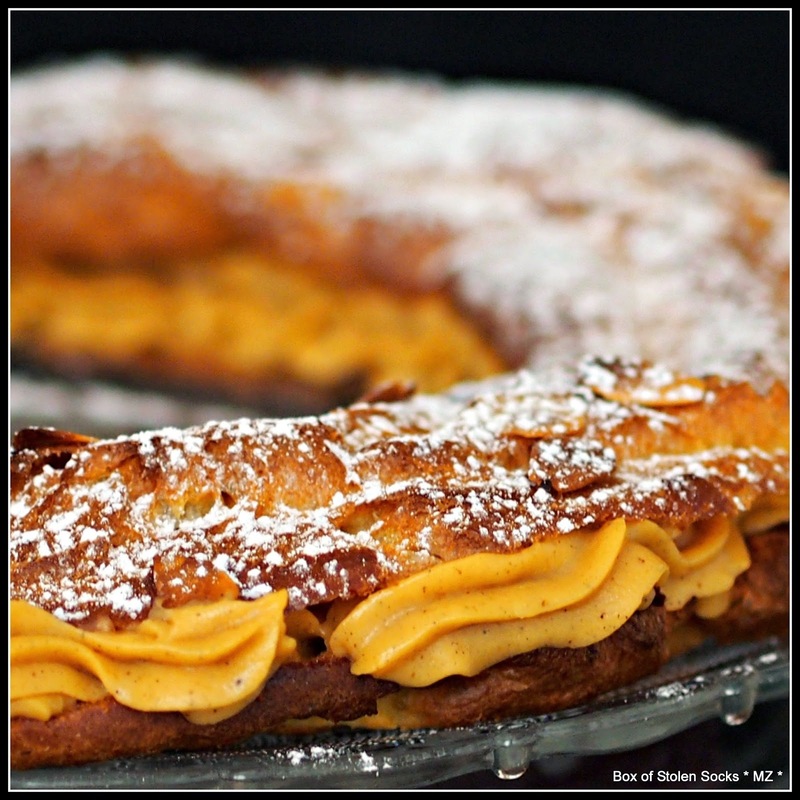 You are going to have some leftover dough, which you could make into éclairs or cream puffs. Gently score the rings with a fork and apply some egg wash. Sprinkle with the sliced almonds. Put it in the oven for 15 minutes. Lower the temperature to 375F/190C and bake for another 20 minutes. If you have an air oven reduce time by 5 minutes. When it is puffed, brown and firm turn the oven off, open the door and allow it to dry in the oven for about half an hour. Meanwhile take the pastry cream and praline out of the fridge and let them come to room temperature. Mix about 80 to 100gr of the praline with pastry cream and put it in a pastry bag fitted with a large star tip. Construct your masterpiece: Slice off the top half of the cream puff ring, using a serrated knife in a gently sawing motion. Put the bottom half on your serving dish and pipe the pastry cream in circles or shells. Gently place the top half of the pastry on top of the cream and sprinkle with icing sugar. Refrigerate for at least 1 hour before you serve and bask in the glory of your efforts!